Everybody likes a discount. Discounts knock off some of that retail markup and make buying easier. Markdown is a writing system that is like getting a discount on writing web content. It makes writing easier. I am always looking for ways to make writing easier. Office applications are a PITA for writing on the web. The bells and whistles make writing for print easier, but can add real frustration to a document that's bound for html. 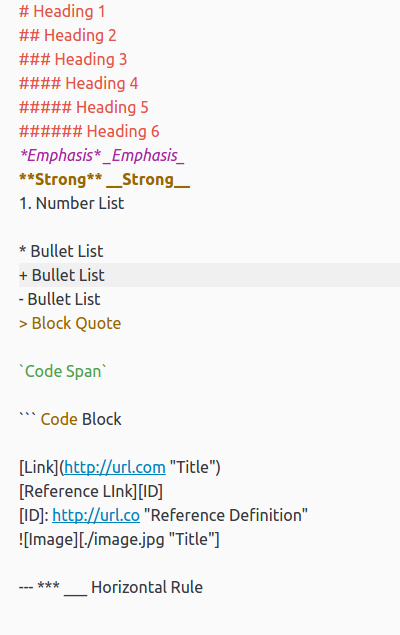 Saving .odt or .doc files as html adds too much style information for my taste. 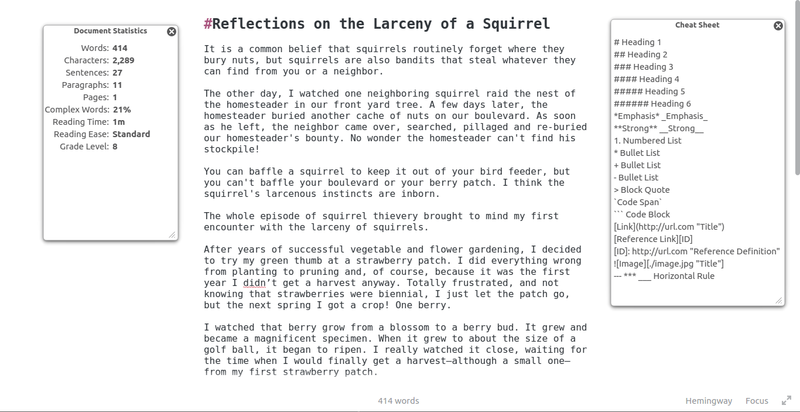 Although my CMS came with Tiny Mice, I found that Tiny Mice also added styles and formatting I had to work around. Better to start from scratch. For several years, I wrote in plain text and added html markup using Bluefish Editor. Bluefish supports the programming and markup languages that developers and designers use to create dynamic, interactive websites. However, I often had to double check to make sure I had declared all the headings and style classes my page needed. I also missed the word count function I used in my office program. Sessions that allow you to make your files into projects. The ability to customize your page width so that you can be sure your content will fit your web template. A word count function that helps with pagination if you need it. A side panel that lets you bookmark sections, chapters, or scenes. Formatting for headings, bold, italic. Still, I had to go back through each document to add the html mark-up. To preview the page, I had to paste the content into Bluefish to use its preview functions. About a month ago, I began experimenting with a new way of writing. I first read about it some time ago, but I was skeptical. It wasn't html, the basic "language" that web browsers understand. They appeared to be opposites: HTML is a markup language. This new discipline is markdown. Yet, it promised to make writing easier if I just learned a few of its tricks. Markdown is a system for writing content where the writer can focus on the content and not think about the coding. It is especially useful these days since many web designers allow their css files to set the styles. Of the four, I was, at first, most impressed with Ghostwriter. As well as a cheat sheet to use as a markdown reference, it also has a complete set of document statistics. A real bonus is the HTML preview which you can export either as simple or structured (i.e., styled) HTML. I was also impressed with Atom, but I worried that the learning curve might be too twisted for me to navigate. Then, one day I needed two files open at the same time. 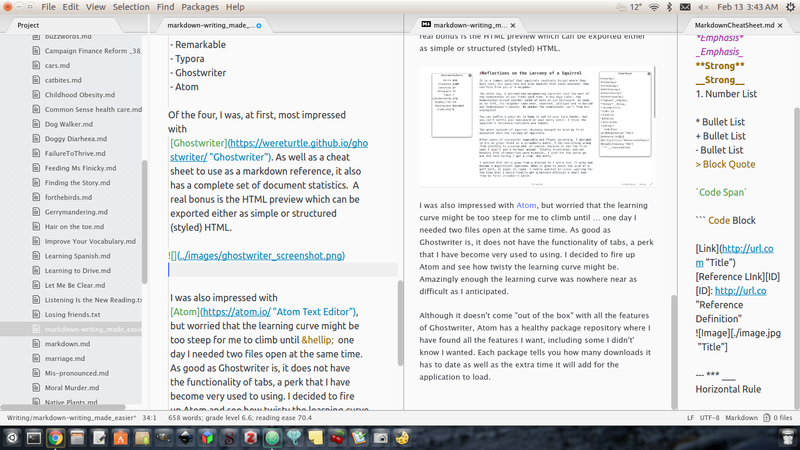 As good as Ghostwriter is, it does not have the functionality of tabs, a perk that I have become very used to using. I decided to fire up Atom and see how twisty the learning curve might be. I was amazed to find that the learning curve was nowhere near as difficult as I had anticipated. Although it doesn't come "out of the box" with all the features Ghostwriter has, Atom has a healthy package repository. There I have found all the features I want, including some I didn't know I wanted. Each package tells you how many downloads it has to date as well as the extra loading time it will add to the application. The one thing I couldn't find in the package repository was a markdown cheat sheet, so I built one. As it promised, markdown has made writing easier for me. If you are looking for something to give your writing incentive a boost, copy and paste the cheat sheet. Then download one of the excellent markdown applications .or read founder John Gruber's easy tutorial. Make writing easier.